MyRFS is a website built especially for volunteers, providing access to Service information and news, brigade management tools and incident information. MyRFS was originally launched on 1 July 2005 and in 2012 underwent a major upgrade, providing access to more tools and information. Work is continuing on improving the site for all members. Access to MyRFS is limited to volunteers and staff. There is no need to register – every member has a login. Members can obtain their login details from their District office, or if they have their Firezone or volunteer number, reset their password on the site. MyRFS is available 24 hours a day, 7 days a week, 365 days a year. For more information or to register, visit www.myrfs.nsw.gov.au. I have a new login user name and password, how do I login? Go to www.myrfs.nsw.gov.au and login using the new details. Once you login for the first time you will be asked to create a new password – make it one that is easy to remember and more than six characters long. Type in a password that you can easily remember, and type it in again in the Verify Password box. Note: As a security measure, you will be unable to use the 'remember password' feature in your browser. This means you will have to re-type the username and password each time you login in to MyRFS in the future. I am a volunteer and I don't yet have a login details, how do I get one? 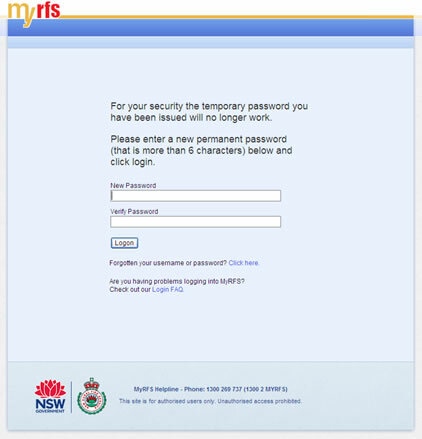 All NSW RFS members have been issued with new login details for MyRFS. This information has been emailed to District Offices across the State. If you have not yet received the login, please contact your Captain or Secretary. If you are a Captain or Secretary and have not received the login details for your brigade, please contact your District Office. The District Office can provide you with the logins as well as a Brigade Information Pack. If you know you have a valid email address registered with us you can simply reset your logins details. Click verify. The system will email you your username and temporary password within 30 minutes. I am a staff member as well as a volunteer and I haven't received my login? How do I get my new login? Email myrfs@rfs.nsw.gov.au with your first name, surname, brigade name and if possible your volunteer number. We will send you your new user name and password. If you know you have a valid email address registered with us you can simply reset your logins details. See "I am a volunteer and I don't yet have a login details, how do I get one?" for how to reset your username and password. I am a staff member and not a volunteer, how do I login? There has been no change to your login. You can login with your network username and password as usual. Can I use my old login to get into the new MyRFS? Yes you can login but you will only get restricted access to the site. To have full access to the new MyRFS please use the new login which has been issued to you as explained above. I can get onto the new MyRFS site but have can't seem to open any of the functions. What is the problem? If all you can see is the My Profile dropdown box in blue at the top of the page, then you have logged in with your old MyRFS username (the one with three letters and three numbers) and password. To have full access to the new MyRFS please use the new login which has been issued to you as explained above. When I asked my District Office for my login they don't have it, how do I get my login? 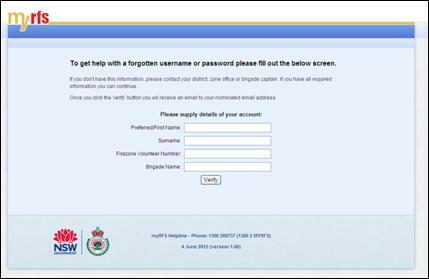 There are a small number of people who have not been issued with logins details, please contact us directly at myrfs@rfs.nsw.gov.au to be issued with a user name and password.